One of the things that amazes me about the iPhone is the way in which it can be used in so many different ways thanks to the power of apps. I'm always interested to see new uses of the technology and so was particularly keen to take a look at GeoWiz which is a new app in the area of teaching. 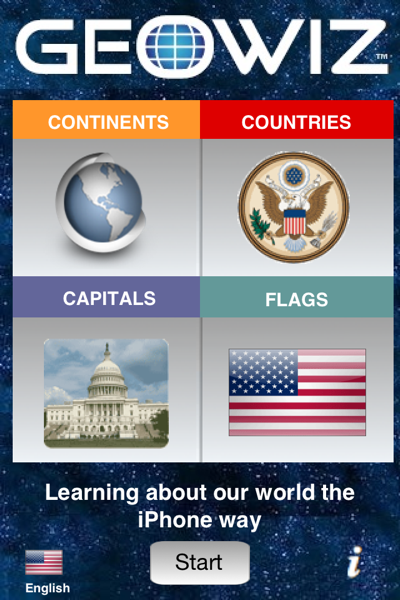 GeoWiz is an app aimed at children to help them make Geography "fascinating and interesting". It originally started as a board game elementary school project in California before becoming a "social mission software solution" app of which 50% of the apps selling price goes towards supporting schools. With some interesting features such as Game Center integration and a points system, this should be an interesting app in the new medium of digital teaching. When I was growing up, I had a subscription to an excellent magazine called "Wally's World". It was part of the "Where's Wally" series and each issue looked at a different country and details such as culture, flags, animals, etc. It was a great way of learning as it was fun, had a few games (mainly word searches), but above all it was easily digestible knowledge. 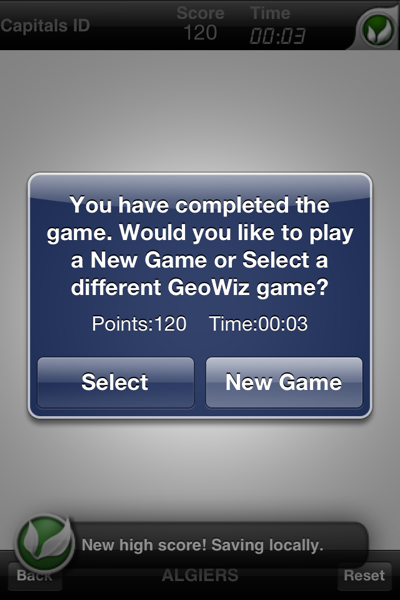 In many ways, I was hoping GeoWiz was going to be something similar with fun games and lots to learn. Unfortunately, that is not the case. Firstly, lets take a look at what GeoWiz offers. 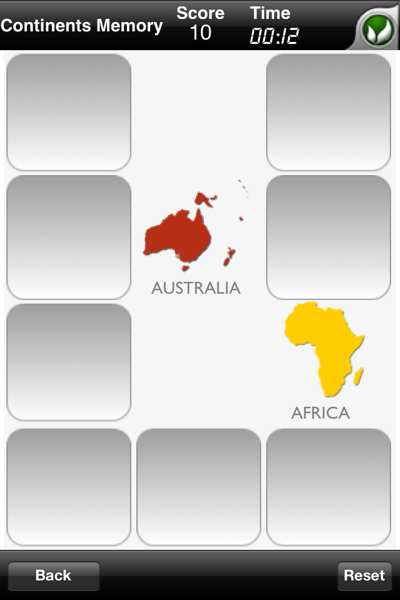 The general premise is a number of games based around memory retention of key facts around Geography, namely continents, countries, capitals, and flags. 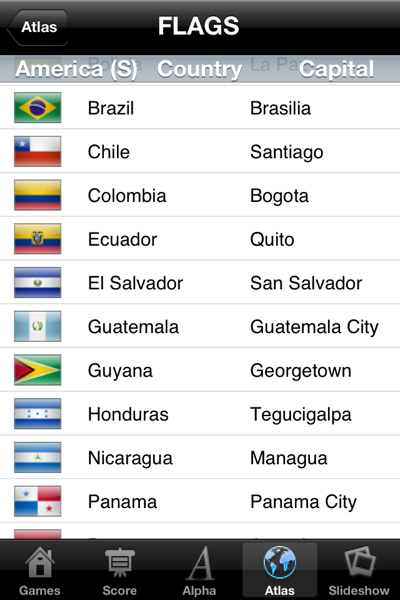 These games can either be the standard "matching certain objects under revolving tiles" genre or tapping on a country to match it to the capital listed at the bottom of the page. The tile game is pretty good but doesn't really help you learn anything (after all, you're matching shapes as quickly as possible, not taking them in). The flag game, on the other hand, is incredible difficult. 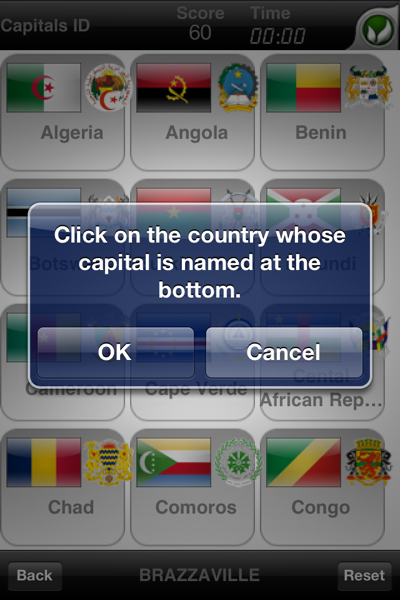 I had no idea which country had "Brazzaville" as a capital so I just tapped each of the flags as quickly as possible until I found which one it was. There aren't any point deductions for getting answers wrong so you can win the game fairly quickly just by tapping all over the place. That's when I found an interesting bug; all of the answers are behind tiles in reverse order. If I tap on the bottom right-hand corner and then move my way right to left up the board, then that appears to be the solution almost every time as demonstrated by the screenshot below showing a perfect score in 3 seconds. So much for the gaming, how do you go about learning? 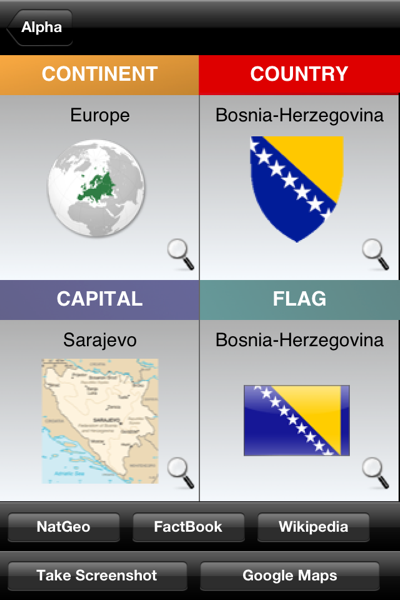 Rather than details on each location in the style of an encyclopaedia, countries are just listed out with their flag, name, and capital. There are 4 screens yet each of them are the same just with a different sort order. Tapping on a country gives you the same information but a bit larger. However, there are links to other services such as Wikipedia and NatGeo. Unfortunately, these are just inbuilt Safari windows that show no indication of loading and lack the controls of the native browser. It would probably have been better to have external links open in Safari or even to have an "Open in Safari" control for those that want to bookmark or have more control over the browsing experience. I was willing to put the issues above aside as the app has some interesting credentials in terms of it's creation and how it is supposed to be used. For example, it contains OpenFeint and Game Center integration to keep children interested in progressing and competing with their friends. I appreciate the idea of adding integration for gaming networks and it's one of the things that persuaded me to review the app, but the implementation is lacking. There are only 3 achievements and they are all trivial to unlock, especially for the Angry Birds generation. Also, the issues with gameplay I mentioned (e.g. easy to cheat) will make a mockery of the leaderboards very quickly. 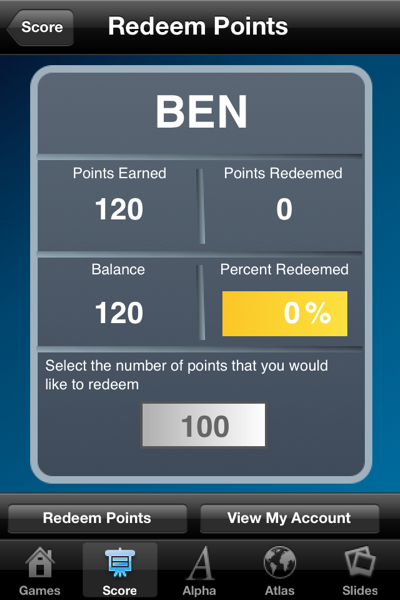 Another area of interest is to use points earned in the games to get pocket money. Again though, the feature is let down by lack of basic UI work. The feature is hard to find and it isn't immediately obvious how it works or how you set it up - I only knew what it was due to a short description on the iTunes app page. I also have an issue with tying revision into pocket money as this smacks of bad parenting to me. Not being a Father, I can't really comment but I wouldn't want my children coming to me with an app and saying "I got 150 points so you owe me £1" especially when it is so easy to game the system. It seems to me that both parent and child would be better served by reading through a child's atlas together and keeping rewards for when they've actually passed a test or school or gained a good grade, not for when they've done a bit of revision. 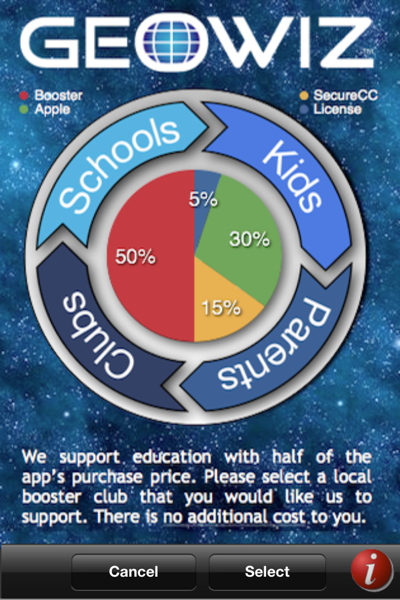 The final area in the app that interested me is the promise that 50% of the app sale price goes to your child's school. It turns out that you need to find the button to do this (which isn't obvious) and then choose from a prefilled list of US schools. Whilst I appreciate the intention, it seems a little pointless to me. I'd rather use the 50% (which is £6 or $10) on the pocket money reward or actually giving it directly to my school especially as I'm based in the UK. Also, it would make more sense in my mind for the "choose your school" screen to happen automatically the first time you open the app. 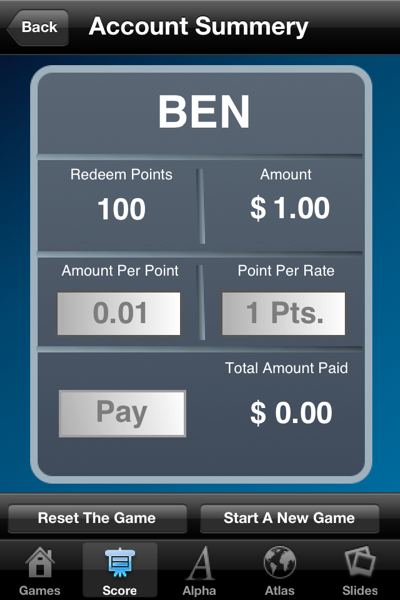 That ensures that everyone who uses the app gives a donation and also makes much more sense from a users perspective. 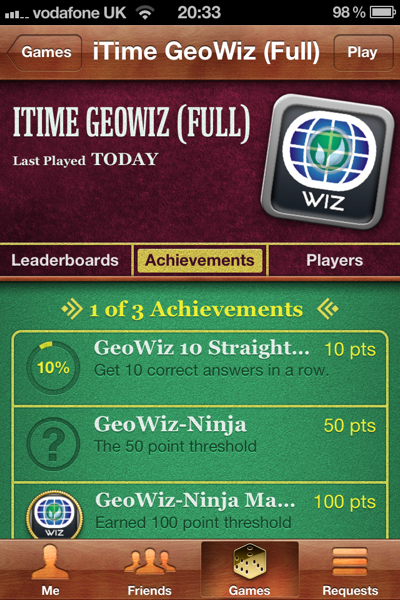 On the whole, I'm not terribly impressed with GeoWiz. It has good intentions but the app is severely lacking in polish or finesse. From the app side of things, it doesn't support the iPhone 4 Retina Display so looks awful on any new devices. This is unacceptable in my mind as adding retina support is trivial, especially for a new app. Aside from technical implementation, there is a distinct lack of structure to the application. The main menu can only be accessed when you first open the app and you can't go back unless you force quit from the multi-tasking tray. Whilst all of the menu options are available on every page, it's the fact that you can't go back to a page you've previously seen that doesn't sit well. Add to this the lack of the regular status bar so you can't see battery life, network activity, or the time (all important things), poorly laid out navigation controls, and lack of instruction on complex features like points rewards and I can see both children and parents getting frustrated quickly. Yes the games are fun (for a time) but the poor build quality means they are easily cheated. In short, your child is unlikely to gain much from this app. Geography is not simply knowing what the capital of the Congo is and identifying it's flag. It's about culture, the uniqueness of a place, and what we can learn from it. If I had £11.99/$19.99 to spend on teaching my child geography, I'd invest in either a child edition atlas or encyclopaedia and spend some quality time with them telling them about the world. I'm hopeful that one day someone will create an app similar to the "Wally's World" magazines of my youth as there is real potential for child and parent to learn together (especially with the iPad). However, GeoWiz is not it. Disclosure: I was given a free copy of this application to review. I tested it on an iPhone 4 running iOS 5.0 beta 2. If you have an app for iOS that you would like me to review, please contact me. The inside story on powering Highlights » « Does iOS 5 finally allow retina display iPhone apps to run unscaled on the iPad?